‘The region’ has been used to understand and propose solutions to phenomena and problems outside the dominant spatial scale of the twentieth century – the nation state. Its influence can be seen in multiple social science disciplines and in public policy across the globe. But how was this knowledge organised and how were its concepts transmuted into public policy? This bookcharts the development of the academic field of Regional Studies and the application of its concepts in public policy through its learned society, the Regional Studies Association. In their modern form, learned societies often play a complementary role to universities, offering networks that operate in the spaces between and beyond universities, connecting specialised academics and knowledge and making it possible for them to have impact outside the academy. In contrast to the geographically tangible and popularly understood role of the university, contemporary learned societies are nebulous networks that transcend barriers and whose contribution is difficult to discern. However, the production and dissemination of knowledge would be stunted were it not for the learned society connecting scholars through a network of publications and events. 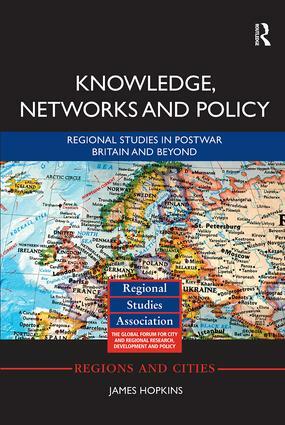 This book traces the intellectual history of regional studies and regional science from the 1960s into the 2000s and the impact of the regional concept in public policy through the changing priorities of government in the UK and Europe. By approaching the history through the Regional Studies Association, it interrogates the role and function of the ‘learned society’ model of organisation in contemporary academia and importance as a knowledge exchange vehicle for public policy influence.